I was about 7 years old when I remember learning about Elvis Presley. One of his many hit songs was playing on 1050 CHUM while I rode in the car with my Nanny, I don’t know where we were going and it didn’t really matter, it was always a treat to just be with her in the car. I heard her sing a line or two from the song and then she sang, “return to Cindy” over Elvis’ crooning and shook my world. The song was Return to Sender from the movie Girls! Girls! Girls! and my Nanny explained that she would always sing “return to Cindy” instead of “return to sender.” In an instant, I was filled with joy that my Nanny would sing my name instead of the correct lyrics and that’s when Elvis Presley was etched into my memory. When I was about 8 and I was on one of many, MANY sleepovers at my Nanny and Grandpa’s house, I was looking through one of her magazines and I saw it. The Jungle Room. Probably the most famous room at Elvis’ Graceland. That’s where it was born, my desire to see this man’s house. When I was about 9 years old, I found out that Elvis died. I was in my classroom at the end of the day, getting my outdoor shoes on and talking to my teacher when the subject of Elvis came up. I remember nothing about the conversation before learning about Elvis’ death and nothing after, because… that was the day I found out that Elvis had been dead for 17 years. When I was about 11, I was completely obsessed with wedding videos. I would watch my aunt and uncle’s wedding videos over and over again, but the video that had the most impact on me was my Auntie Charlotte and Uncle Darren’s, my mom’s sister and brother-in-law. They were married in 1986, but most of their reception music was classic oldies. I remember dreaming about my own wedding one day while watching my Nanny and Grandpa, so in love, dancing and singing along to Can’t Help Falling in Love. They floated around, stared into each others eyes and sang those words to each other like it was their own wedding, like no one else was even in the room. That moment is so imprinted on my memory I can’t listen to that song without crying since my Grandpa died. When I was about 15, I was introduced to Elvis the actor. One lazy Sunday afternoon, my mom and I huddled in and watched Love Me Tender on TVO. He was the most beautiful thing I had ever seen and seemed to have all those ‘50s gentlemanly qualities that were already so lacking in my generation. I had such a great time vegging out with my mom that we made a date to TVO’s next Elvis movie the weekend after. You see, for all of my childhood, Elvis’ music surrounded me. My Nanny and Grandpa were always listening to 1050 CHUM or other popular music from their generation. My mom was always playing oldies music at home too. Sure, there were The Everly Brothers, The Platters and Patsy Cline… But Elvis was the standard. Elvis Presley’s music simply defined my entire youth. I’m no die hard Elvis fanatic, in fact, I only have 21 of his songs on my iTunes. I own none of his movies. I don’t have a t-shirt with Elvis’ face on it. I don’t have a pink Cadillac toy. I don’t bid on red Elvis scarves on eBay. All of my affection for Elvis is a direct result of my upbringing. A direct result of my Nanny and Grandpa, their love for each other and their love for me… And for the innocence of that, I’m so thankful. 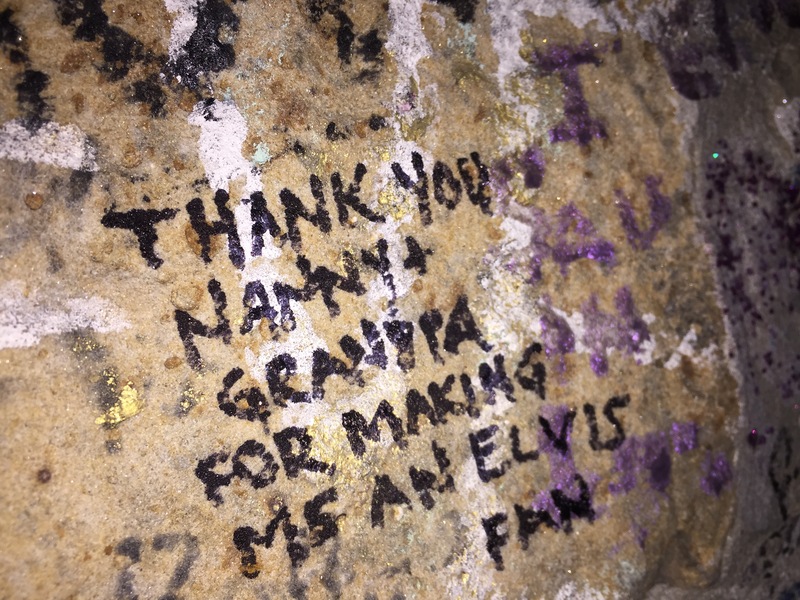 Fans would write messages to Elvis on the wall around the perimeter of his house, and they still do to this day. Luke encouraged me to leave my own mark too. Previous post Respect the Wind.